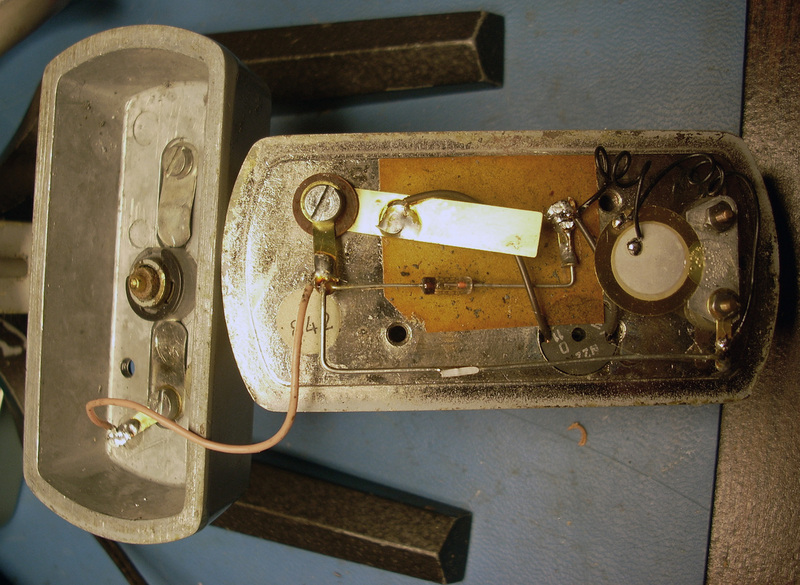 This timing machine is transistorized and a little newer (1960's) than the tube-type timing machines I've restored. According to the back plate it is a model T46 and was manufactured for L&R by Bandelin Electronic in Germany. Raising the top cover reveals the internal workings. The printed circuit boards (PCB) are protected by the black plates. 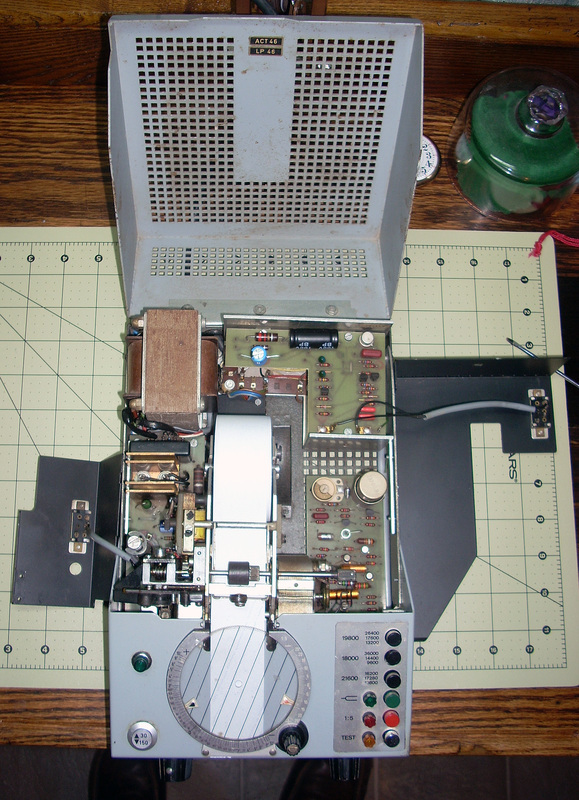 The machine needs a lot of cleanup but should make a nice timing machine once repaired. This is the chassis before restoration. Inside there's a lot of crud, an exploded electrolytic capacitor, a broken fuse holder and several loose wires from someone's previous attempt at fixing it. 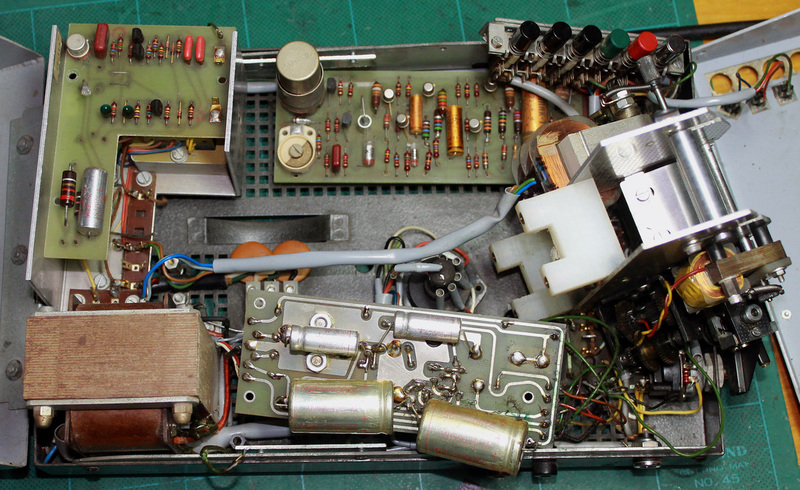 All the electrolytic capacitors will need replaced. 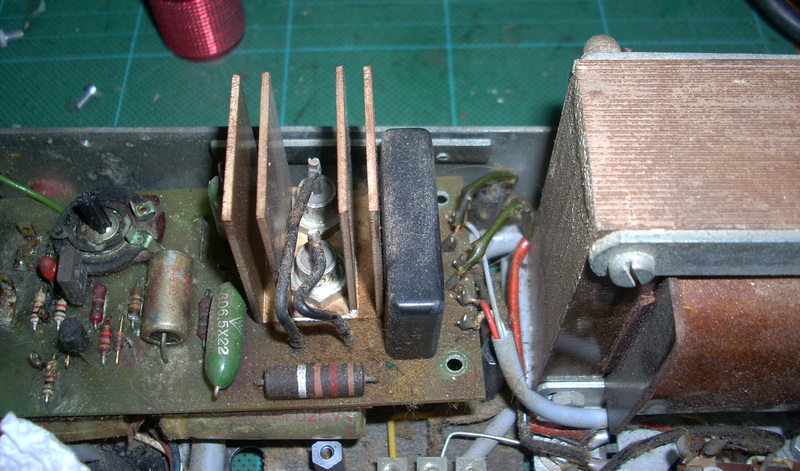 A closeup of some of the crud on the power supply board. I think a lot of this stuff is from the exploded electrolytic capacitor on the power amp PCB. 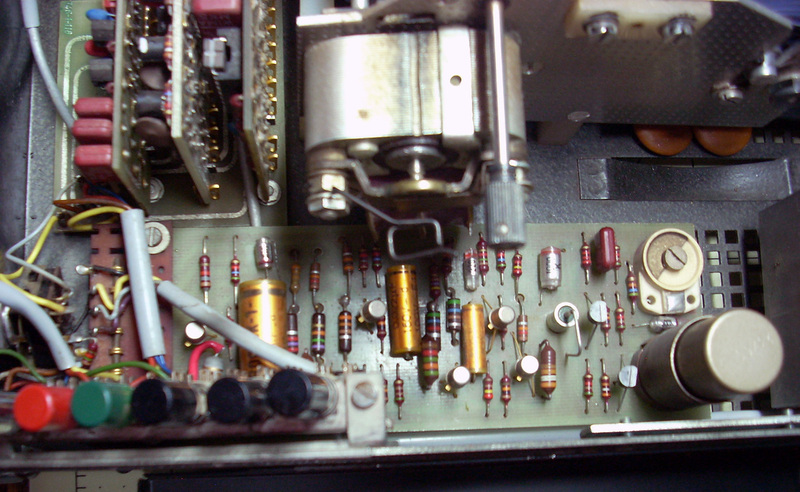 The diodes on the heat sink are the 15-volt zeners for the power supply. One of the zeners was not regulating the voltage and it turned out to be a corroded wire/bad connection to the top post of the diode. The black block is the full wave bridge rectifier. 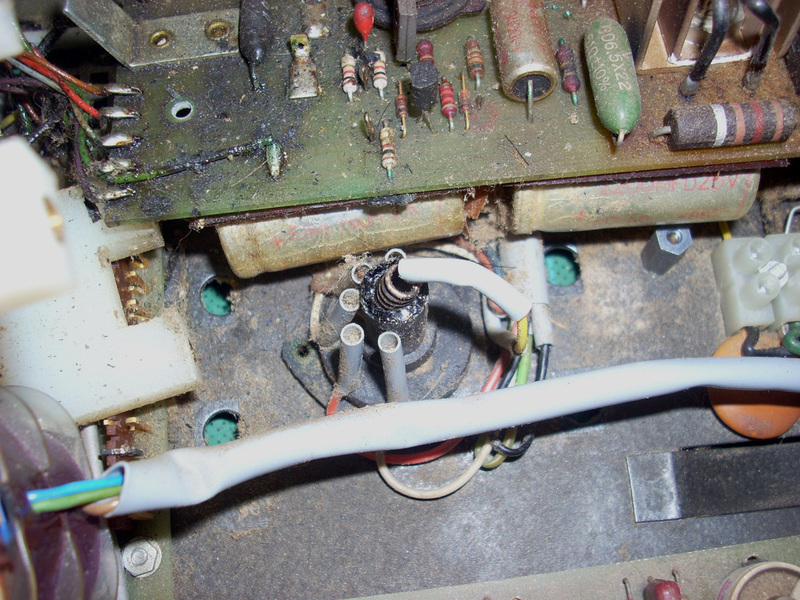 The broken combination fuse holder and A. C. voltage selector switch. I don't have a replacement for this so it will have to be repaired (see next photo). The chassis after a good cleaning and just getting started replacing the old capacitors.The power supply board has been flipped over to show the old electrolytic caps on the underside. 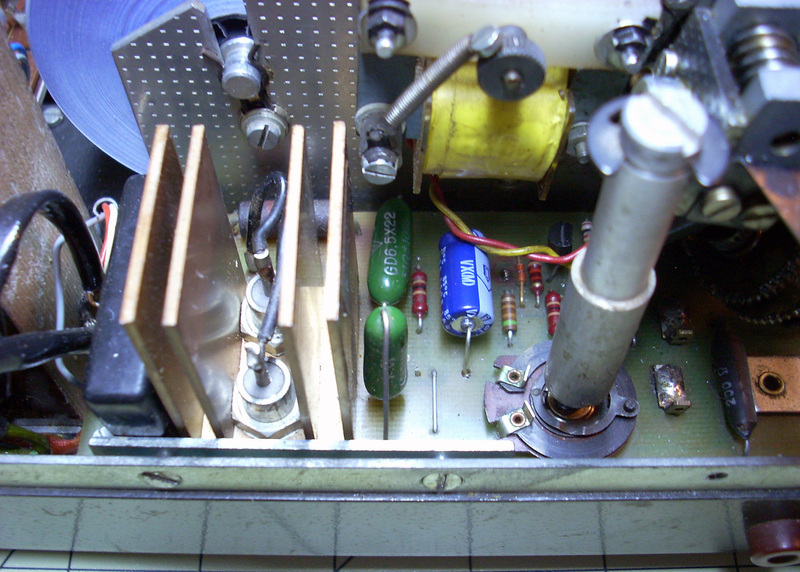 The repaired fuse holder is visible in the center of the photo. I used J-B Kwik Weld Epoxy to fix it. 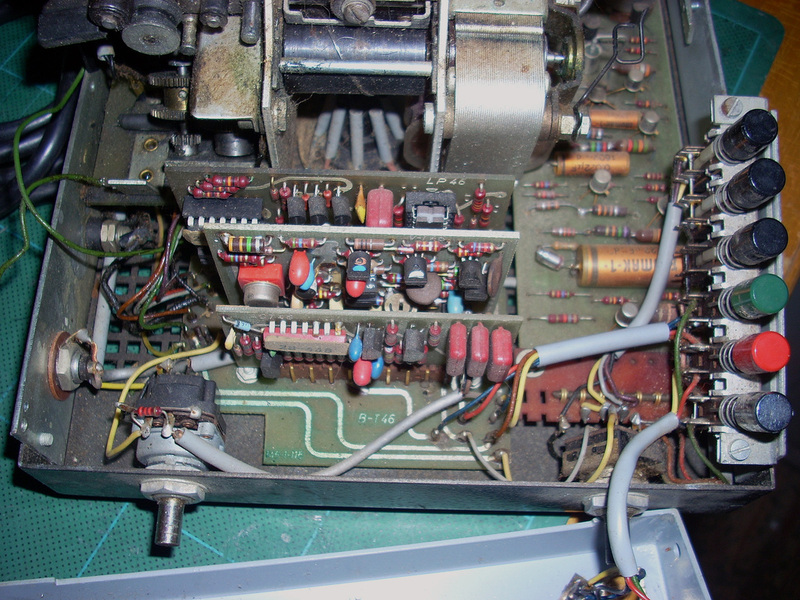 The generator board after cleaning. The round cylinder in the lower right is the crystal. One out-of-tolerance resistor was all that needed replaced on this board. 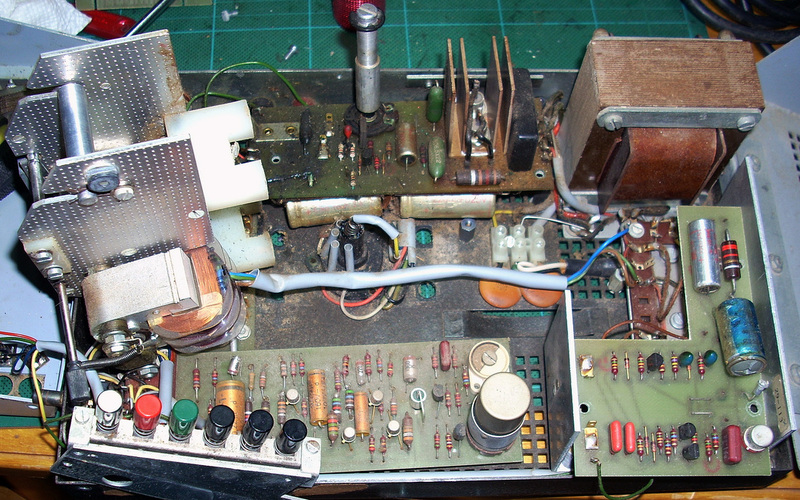 The power supply board reinstalled after cleaning and replacing the electrolytic capacitors. The variable control is for adjusting print density. 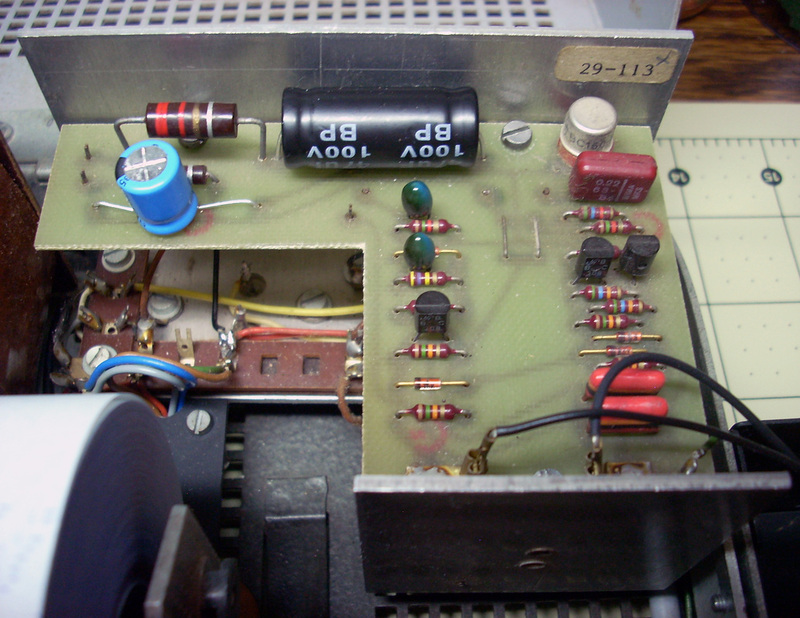 The repaired power amplifier (motor drive) board with new capacitors installed. The black capacitor is non-polarized and replaces the one that exploded. All cleaned, repaired and ready for the covers to go back on. The watch holder contains a crystal microphone element. These are Rochelle salt crystals and are moisture sensitive. This one has absorbed moisture and is ruined - the crystal has peeled apart. 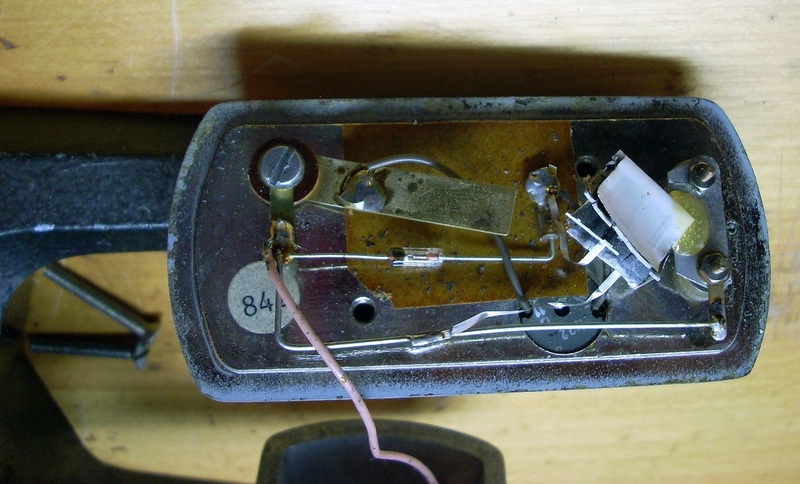 The old crystal has been replaced with a modern ceramic piezoelectric pickup element. These ceramic elements don't have as high an output voltage as the salt crystals but still work OK.
Below are a few test printouts after repairs. The replacement ceramic piezoelectric element works fine. 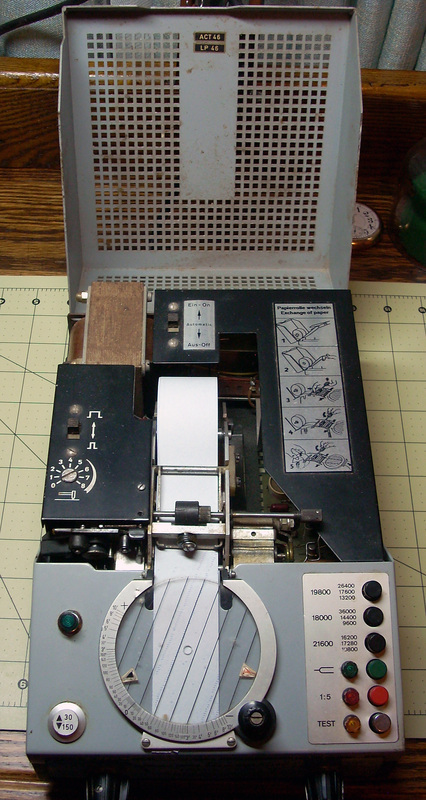 Here is a sample printout of an Accutron model 218. The error rate is about minus 8 seconds per 24 hours. The electronic 1:5 lens makes it easier to measure small errors. This is a printout from an 1891 18-size, 7 jewel Elgin pocket watch. This watch is loosing about 20 seconds per day. And this last one is from an 1881 Waltham Broadway key wind pocket watch. It's gaining about 40 seconds in 24 hours.